Just as the Willamette River joins the Columbia River to become one, alternative therapies can be integrated with conventional medicine to become a truly holistic approach, unique to each of our patients. We rely on conventional diagnostic tests to help clarify the seriousness and expected outcome of a disease process. We also depend on conventional drugs and surgery when we need to rely on a fast, predictable course of action for urgent and severe conditions. Medications and surgery alone, however, are often insufficient to bring the body into balance to restore good health. Sometimes our patients have conditions that don’t respond well to conventional therapy, or conventional therapy may cause intolerable side effects. By including alternative therapies that are safe and have the potential to help allows us to have a few more tools in our toolbox to offer our patients. At Two Rivers Veterinary Clinic we also want to be a resource for patients who may benefit from alternative therapies but are under the care of a primary veterinarian who may not offer these services. We know how important your relationship may be to your current veterinarian and fully support that relationship. We enjoy being part of a team of professionals who can assist you and your pet. If your veterinarian has specifically referred you to us, our consults integrate seamlessly with your current treatment plan, enhancing its effectiveness instead of replacing its components. Two Rivers works closely with your current veterinarian to ensure each recommendation is the best option for your pet, continually communicating our findings to accurately track their progress. Our goal is to heal your pet using total veterinary collaboration. Acupuncture helps the body heal itself. This ancient Chinese practice utilizes hair-thin needles to stimulate the body’s nervous system, regulating blood circulation and releasing pain-relieving hormones. This process treats excess/deficiency imbalance and especially stagnation in the energy channels of the body allowing our patients to heal more rapidly. 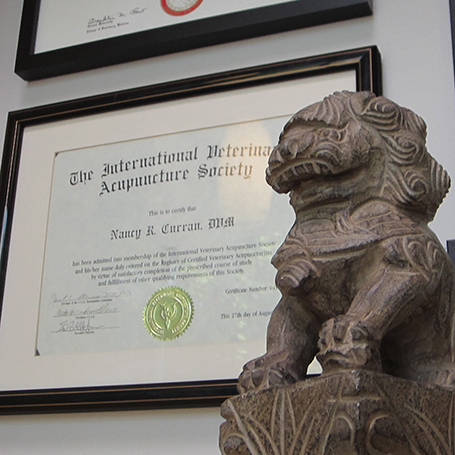 Acupuncture is often a very useful drug-free complement to a larger pain management plan or even sole treatment for painful conditions. Veterinary chiropractic is the process of manual manipulation of an animal’s spine and joints. This hands-on approach to medicine uses physical movement to remove blockages and normalize body processes using no medication or invasive procedures. Chiropractic restores the body’s natural alignment, healing current injuries and helping prevent new ones. Veterinary herbal medicine utilizes the ancient practice of using natural herbs to treat and cure disease. Medicinal herbs, and their derivatives, are full of a wide range of pharmaceutically active ingredients with beneficial properties. Two Rivers herbs are sourced from premier growers from around the world, resulting in potent and safe medicinal plants grown without the use of dangerous pesticides. Chinese Herbal Medicine is part of the ancient practice of Traditional Chinese Medicine. The herbal formulas we prescribe come in either a powder (granular) form that can be mixed with moistened food, a liquid (tincture) form that can also be mixed with food or given directly by mouth, or in tea pill form (BB-sized smooth black pills) that can be hidden in a treat or given directly by mouth. Western Herbal Medicine is based on a rich European tradition of using plants and herbs to aid in the healing process. These herbs are usually prescribed in a liquid (tincture) or capsule form. Nutraceuticals are products that often contain a mixture of herbs and nutritional supplements that work synergistically to support various body systems or structures. They usually come in capsule form. There is a great wealth of knowledge about the active constituents of the herbs we use. Using whole herbs rather than concentrated isolated ingredients allows us to utilize the naturally occurring phytoconstituents associated with the active ingredient which often work to enhance the healing properties and offset potential side effects. Herbal medicines can be used in conjunction with other alternative therapies like acupuncture and chiropractic to construct a truly holistic health regimen. Integrated alternative therapies are highly successful in managing many chronic conditions and improving general wellbeing. Although herbal therapy can usually be combined with conventional drug therapy, potentially hazardous interactions can occur; your experienced Two Rivers veterinarian only will prescribe safe and tested pharmaceutical combinations.